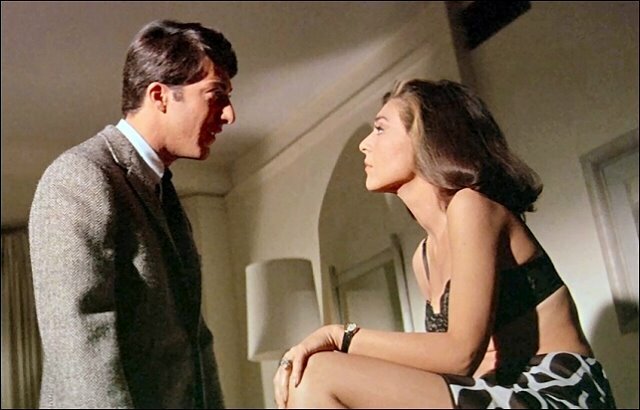 The 50th Anniversary (actually Christmas 2017 in North America) release of The Graduate is an odd anniversary for me. I now discover that the film is deemed a classic and it has received the same 5 star reviews that all ‘classics’ seem to receive automatically. I’ll have to wait until I watch it again in a cinema to see what this means in practice. 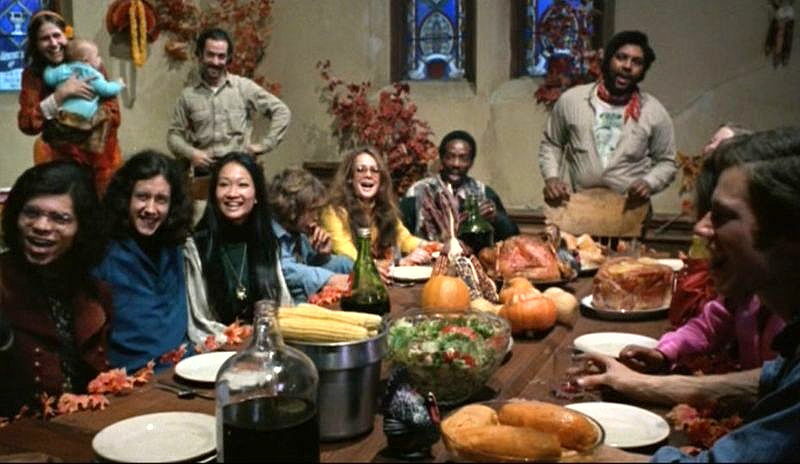 For now I want to try to remember the first time I watched it during 1968. The circumstances are memorable since it was a preview screening several weeks before the UK release (which was several months after the US release date). My university Student Union received a large number of tickets for a late night screening (i.e. after the last house) at the London Pavilion, the large cinema still standing but no longer showing films, on Piccadilly Circus. I don’t remember how we got back to our digs in Streatham at 2 a.m. in the morning but I assume we got the night bus. I think I must have enjoyed the film and I think we followed the distributor’s plan by talking about it to friends several weeks before its London release in August 1968. 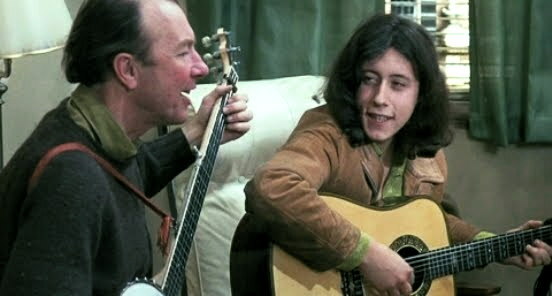 My main recollection of the film is that I was taken by Paul Simon’s songs more than the film itself. I think I already knew ‘The Sound of Silence’ and ‘April Come She Will’, but ‘Scarborough Fair’ and ‘Mrs Robinson’ were possibly new to me. I enjoyed the film which I found very funny but I’m not sure what kind of lasting impression it made on me apart from the music. The soundtrack was certainly innovative and predated Easy Rider (1969), Mean Streets (1973) and American Graffiti (1973) – the most frequently quoted music soundtrack ‘breakthrough’ films. Pop music had often been used in Hollywood films in the 1950s and 1960s before The Graduate but never so carefully integrated in the narrative and certainly not in a film that wasn’t ostensibly about musicians or the music industry. The one odd aspect that occurs to me now is that Paul Simon’s songs and Simon & Garfunkel as a duo were very strongly connected with New York and I’d forgotten that The Graduate is an LA movie. Listening to an item on the re-release on Radio 4’s The Film Programme and reading some of the print reviews, I was surprised at several of the comments. Reviewers now seem to focus on the older woman, younger man aspect of Anne Bancroft and Dustin Hoffman, though they know that in fact Bancroft was playing much older than her ‘real’ 36 and was only in fact six years older than Hoffman. I don’t remember being ‘bothered’ by the relationship. It makes me think of Cary Grant in North by Northwest (1959) with his mother played by Jessie Royce who was only eight years his senior. I think that this shows that The Graduate was a film still tied to ‘old Hollywood’ in 1967. It surely isn’t a ‘New Hollywood’ film. I suspect that Mike Nichols is now seen as more of an innovator than he was considered at the time. Yes, he did win the Best Director Oscar for the film, but wasn’t that an indication of how skilfully he made a film in the tradition? Nichols was well-known first as a comedian in partnership with Elaine May and then as a highly-successful director on Broadway. His first three films were all adaptations – Who’s Afraid of Virginia Wolf? (1966) from Edward Albee’s play, The Graduate from Charles Webb’s novel and Catch-22 (1970), my favourite of the three, from Joseph Heller’s novel. Aged 19 in 1968, I wasn’t a cinephile, so I didn’t make critical judgements about The Graduate. I remember the unusual ending better than anything else. 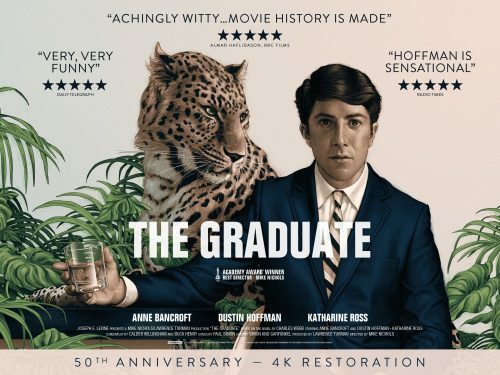 For me, at that time, Dustin Hoffman didn’t represent a young graduate. He wasn’t much like the American grad students I came across in London. It was probably not until Midnight Cowboy in 1969 that I began to think about Hoffman. 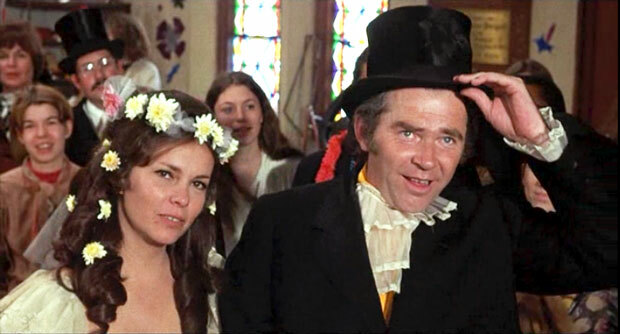 Similarly, Katherine Ross made more impression on me in Tell Them Willie Boy is Here and Butch Cassidy and the Sundance Kid, both also in 1969. Having said that, the notes in my film diary suggest that it was Ms Ross, alongside the music, that caught my attention. It’s important, I think, that in the late 1960s, it often took Hollywood films a good six months to arrive in the UK. The Graduate took eight. Its American success set up its UK opening – it was the biggest US box office film of 1968. The truth was that it was one of the very few witty adult Hollywood films of the 1960s to attract a mass audience (it had an ‘X’ certificate in the UK, making it out of the reach of those under 16). (The script by Calder Willingham and Buck Henry must take plenty of credit.) 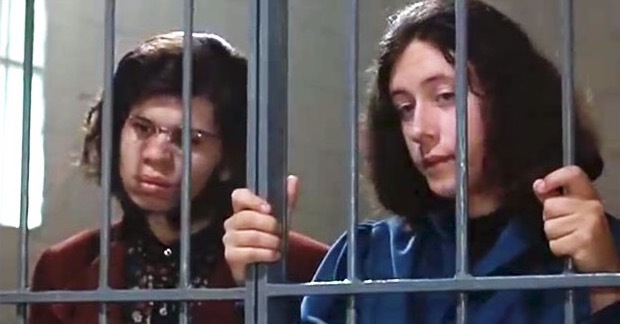 In the UK, the 1960s, for my circle of friends, was remembered mainly in terms of British films. The American box office film of 1968 that made the biggest impression on me was probably Polanski’s first Hollywood film (after he left the UK), Rosemary’s Baby, which I actually saw a couple of years later in a Paramount double bill with Lindsay Anderson’s if . . . . (a 1969 UK release). Here’s part of the ‘Scarborough Fair’ sequence from The Graduate – at least, I think it is, there are so many YouTube clips! I think this represents what I thought was new at the time. Watching it again, it’s the combination of the music with the camerawork by the veteran Robert Surtees that seems important. It’s interesting to read some of the contemporary reviews from 1967. Bosley Crowther in the NY Times was coming to the end of a glittering career as a critic in 1967 when he panned Bonnie and Clyde but praised The Graduate as a throwback to Preston Sturges. Roger Ebert liked the film but loathed the music and the ‘arty camerawork’ shown below. Interestingly, he saw the same vitality in the film that he saw in the British films that had done so well in the US in the 1960s (he was thinking of Tom Jones and The Knack among others). Thirty years later he downgraded his rating and decided that the film had dated and that Mrs Robinson was actually the most interesting character. You have to hand it to the Coens. They are intelligent and highly-skilled filmmakers who know how to engage diverse audience groups. They also like to ‘play’ in a serious way, creating controversies and teasing their fans. The most interesting comment I’ve read about Inside Llewyn Davis is that the title could fit on an album cover and that the individual episodes might represent a collection of introspective songs about the artist’s unhappy lot. That seems a good call to me. Llewyn is an angry man who isn’t making much money from applying his talent in as authentic a manner as possible. He has no home and moves from the floor or couch at friends to the occasional bed. His sister is about to sell his parents’ house. He is primed to insult anyone who offers the hand of friendship – but he is topped in the angry stakes by Jean, one of his former lovers. This is a Coens’ movie though and thankfully he isn’t ‘redeemed’. Many of those who don’t like the film suggest that it has no story or rather no ‘meaning’. I take the story to be about the folk singer who fails to find success because of a combination of bad luck (fate? ), the unfortunate ability to be in the wrong place at the wrong time – just missing being in the right place at the right time – and the inability to compromise just enough to gain acceptance without squandering his talent. For me, the turning point of the narrative is Llewyn’s ‘audition’ for Albert Grossman (or his fictionalised counterpart). This is his big chance to impress the main promoter on the folk scene and he sings a song that many commentators have seen as ‘miserabilist’, a ‘real downer’ etc. In fact it is a beautiful rendition of an old English ballad (arranged in the version that Oscar Isaacs sings by the Irish guitarist Dáithí Sproule). It is contrasted with the smoother, more ‘poppy’ and conventional songs sung by the ‘Jim and Jean’ characters (played by Justin Timberlake and Carey Mulligan) and some other performers. The Grossman who turned down Llewyn Davis would go on to promote Bob Dylan (who appears as a character towards the end of the film) – and the much more polished Peter, Paul and Mary – but who in 1961 doesn’t see what might become a commercial possibility. I think the film is well written, beautifully photographed and, as might be expected from the Coens, the soundtrack is wonderfully arranged/scored/constructed by T-Bone Burnett. Oscar Isaac’s performance of the songs is very good and worth the price of the admission ticket on its own. But here is where the Coen’s get playful and tease. The ‘community’ of singers associated with the Gaslight Café and Greenwich Village generally in 1961 is based on and ‘around’ the historical figures of Dave Van Ronk and several other well-known names such as the Clancy Brothers and Tommy Makem and Tom Paxton. I’m sure I read/heard that the Coens said that they didn’t know that Ewan MacColl only wrote ‘Shoals of Herring’ in 1960 – but the narrative implies that Llewyn had sung the song to his father many years before. Did they really not know? There are other anachronisms as well, including a poster for The Incredible Journey (1963) (part of the entertaining narrative of a Greenwich Village cat). The barely disguised impersonations and sly jokes (Llewyn comments on the sweaters worn by the Clancy Brothers performers) and the anachronisms provide ample material for fans either of the music itself or of the Coens’ films to discuss at length. Inside Llewyn Davis has prompted me to explore Dave Van Ronk’s music. He’s someone I’ve always vaguely known about but never properly listened to and now perhaps I will. I guess it helps (to get funding) if the characters in a kind of faux biopic like this are relatively young and beautiful. I wonder how important Justin Timberlake and Carey Mulligan (whose husband Marcus Mumford has a leading role in the music performed in the film) are to the success of the film for younger audiences? It occurs to me that a biopic of a similarly ‘difficult’ but older and less photogenic character like Ewan MacColl would offer personal dramas, songs at least as good and a similar clash of ideas about where the music should be going – but would add some radical politics as well. The official website for Inside Llewyn Davis carries a useful background piece on the folk scene in New York in 1960-2. Inside Llewyn Davis is clearly a film with American cultural content and it is an ‘American’ film, but it’s worth noting that it has been made in association with StudioCanal – a link going back to the Coens’ early work with Working Title/Universal/Vivendi? – and the UK company Anton Capital Entertainment which currently supplies 30% of StudioCanal’s funding. So Inside Llewyn Davis is technically a US/France/UK film. This was a concert held at the Howard Assembly Rooms in Leeds. The Assembly Rooms were built alongside the Grand Theatre in the late C19th. In 1911, along with similar venues in other towns and cities, they were converted to screening the new ‘flicker’ entertainment. The building was gutted by fire in the 1920s, but in the 1970s returned as a film venue as The Plaza Cinema, which specialised in ‘adult entertainment’. 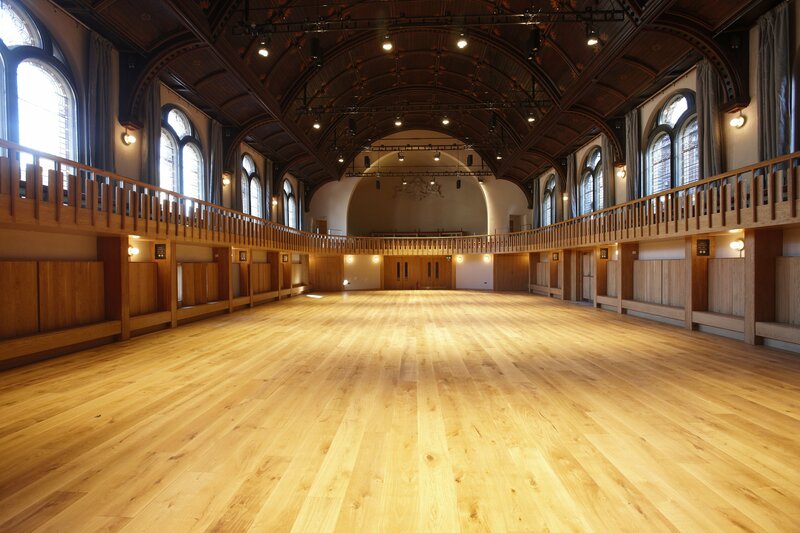 More recently they have been refurbished as a concert venue managed by the Grand. The concerts are varied and include live music accompanying the screenings of films. However, the venue has neither 35mm nor HD digital facilities, so these rely on DVDs. The recent concert featured The Tippet Quartet playing music by composers for film. The Quartet are John Mills and Jeremy Isaac – violins: Lydia Lowndes-Northcott – viola: and Bozidar Vukotic – cello. They have a reputation for playing both new and varied music. The programme opened with Bernard Herrmann’s Echoes. The quartet played this alongside a screening of the last twenty minutes of Vertigo [1958, one of Herrmann’s most famous collaborations with Alfred Hitchcock. The projection had the sound turned down and subtitles switched on. It was clearly sourced from a DVD and not an especially good image. I did not watch the screen, but I do know the final part of the film pretty well: and the relevance of the music to the film seemed to come and go; though it was well performed. The concert picked up after that as we had only music. The next composer was Miklós Rózsa, the winner of three Academy Awards. The quartet performed his String Quartet No 1, opus 22. Bozidar Vukotic, who introduced most of the pieces, suggested that the piece included chords and similar familiar from Rozsa’’ film scores, and I thought I recognised Spellbound (1945) in there. I thought this a fine piece, very well played and enjoying good acoustics from the Assembly room hall. After an interval the Quartet returned, announcing that the forecast heavy snow had commenced. Also to play an arrangements made for them of themes from the film music if Nino Rota, long-time collaborator with Federico Fellini. These included Amarcord (1973), La Dolce Vita (1960), and Otto e mezzo (1963). This was followed by the main theme from The Godfather (1971), the shortest item in the concert. Its brevity surprised the audience who failed to applaud, despite in being performed with excellence. We then had Samuel Barber’s famous Adagio, which has graced a number of films, notably The Elephant Man (1980). It seems it was also played over the radio in the USA when Franklin D. Roosevelt passed on. We then had Bernard Herrmann’s film music, from Psycho (1960), what else. It works surprisingly well as a concert piece, despite it seeming so essentially a set of cinematic sounds. And the concert ended with two tangos. The first by Astor Piazolla was titled Four for Tango, and was partly a tribute to Hermann. The crossover with Herrmann’s music for Psycho was very strong, where as the tango rhythms seemed quite muted. The final piece and tango was Carlos Gardel’s Por Una Cabeza, most famously associated with Scent of a Woman (1982). However, it has been used in at least nine other films. And it provided a lighter but beautiful finale to the programme. It was a really enjoyable evening and worth struggling through the fresh snow as we made our way home. I suppose something by Dimitri Tiomkin would have been an appropriate addition to the concert.